Considering how story-driven modern CRPGs have become, it is somewhat interesting how little attention the old adventure/RPG hybrid genre gets, despite a good many people reminisce the undeniable top dog series (and more or less the only series) of the genre, Quest for Glory published by Sierra On-line, starting from the 1980s to mid-1990s. 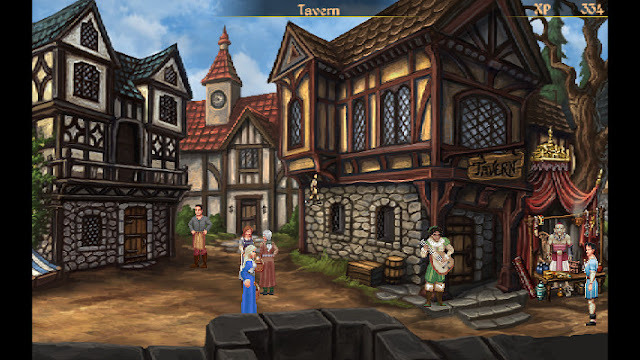 Now the genre is more or less in the hands of a score of enthusiastic hobbyists (like the fantastic free to play Heroine's Quest) and indie devs. That's why it is always a treat to get another new entry to the oh so overlooked genre. Mage's Initiation entered to my sphere of consciousness when I backed it in Kickstarter 6-years ago. Developed by Himalaya, people behind a good many VGA-remakes of old Sierra titles, such as King's Quests from 1 to 3 and Quest for Glory 2, the backing was a no-brainer for me. And now it has finally been released, so how fares it? Instead of a nameless hero in a class of your choosing, you enter in the boots of a young mage initiate D'arc, who is just about to choose his major elemental which will then determine the spell arsenal at his disposal for the rest of the game. The elementals are, as you might suspect, earth, wind, fire and water, all consisting of 6 combat and 5 base spells. The combat spells are used, obviously during the combat, whereas the base spells can be used to solve puzzles and do other stuff outside combat. You begin with only a couple of spells and gain access to more as you advance the story. So, after D'arc has chosen his elemental alignment, he gets cracking on the main quest of the story, completing three trials: collecting a lock of hair from an imprisoned sorceress, getting a Griffon's egg and finally fetching a horn of a trinicorn. Those goals in mind, he leaves the tower that has been his home for ten years of his schooling and meets the locals. The first trial takes D'arc to an island in the middle of a local lake. There he meets a sorceress, who has been imprisoned there for decades after she tried to use her powers for evil. After some mild maze running, the sorceress promises a lock of her hair, if D'arc does a little favour for her. You can always imagine how that goes. Here you can make a choice, which will most likely carry over to any future sequel of the game. After getting the hair, the next stop is in the mountains, where Flyterian bird people are guarding the passage to the griffons. But again things are harder than D'arc originally expected, as there are some hostilities brewing between the noble winged people of the ground dwellers. So before he can get his hands on some eggs, D'arc has to prevent a possible war. 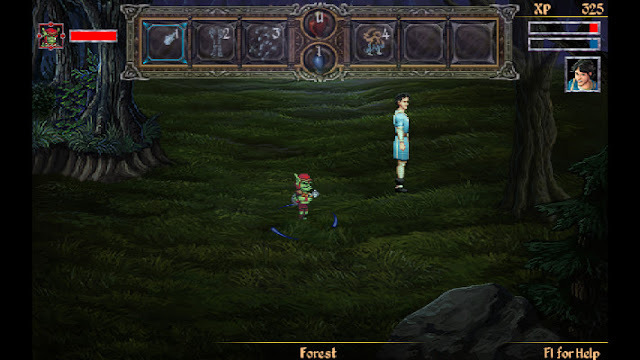 Like the hero he is, D'arc resolves the situations after which he has to tackle the final trial, getting the trinicorn horn from the forest where bloodthirsty redcap goblins dwell. Things are never easy for novices, as you might imagine, and D'arc has to work harder than just asking nicely in order to get his hands on the coveted horn. 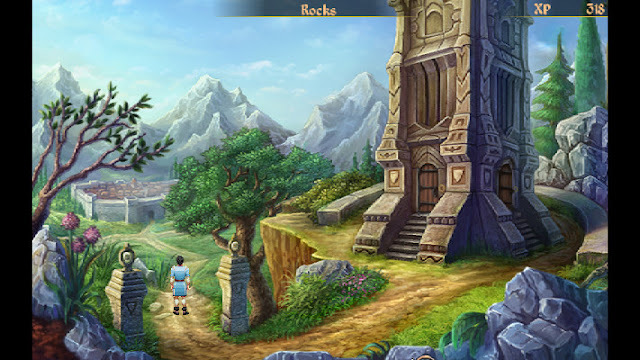 Like in any RPG, there are other distractions to D'arcs way, small quests and puzzles he can solve, but of which some are not necessary in order to solve the game. The little town of Iginor is a place where you can find people who have tasks of their own to give. These quests range from class specific sidequests to some good old "kill the beasts"-deals and hunting items. All of these quests add to the XP, which can be used to level up. 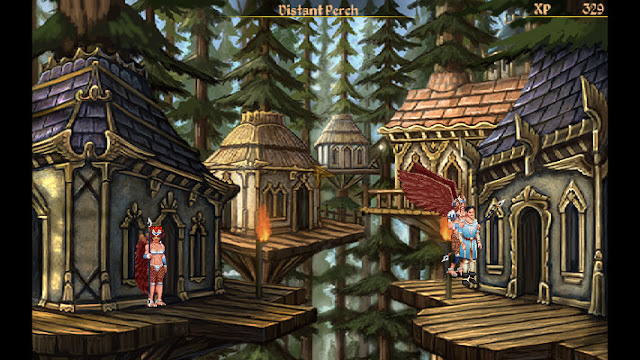 A couple of optional twists and turns aside, Mage's Initiation is a pretty linear game. You tackle each trial in turn, after which D'arc receives additional spells. Advancing the story is the only means to gain these spells. Attribute structure aside, the way Mage's initiation progresses reminds me quite a bit of Quest for Glory 2, which is in a similar fashion very linear game. Future in mind, you do get the possibility to save the character. If the game sells well enough, you then have a character you can export from this game to any sequel there might be brewing. The character progression system is basically a scoring system of a more traditional Sierra game. You are not awarded experience through combat, but solving puzzles. On each level, you get 4 points to divide between strength, intelligence, magic and endurance. 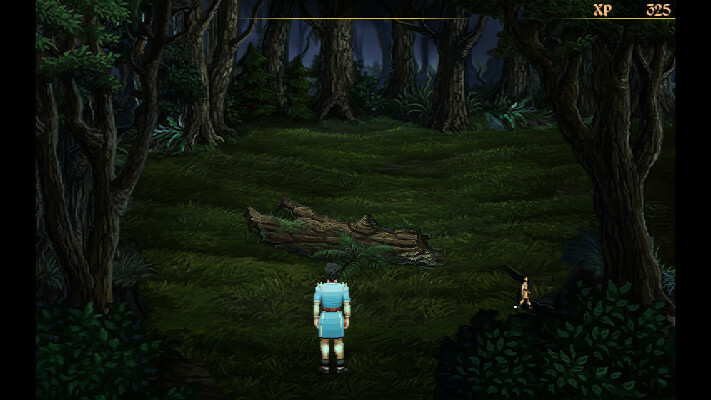 It is a very basic system, all in all, I'd even call it almost barebones on comparison to most other CRPGs. 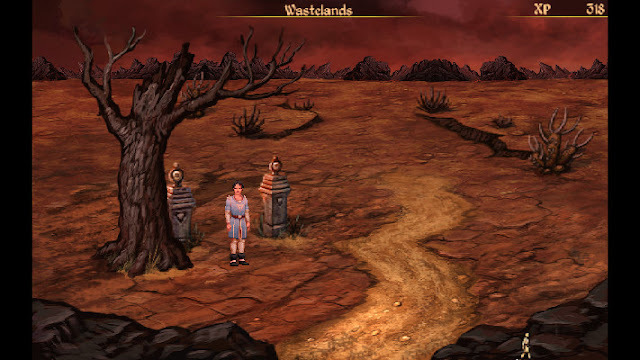 Quest For Glory had far more attributes to develop, but I can see why the developers went with a system like this, considering it is so heavily tied on story progression rather than combat grinding. Then again, Mage's Initiation has only one class, mage, so there is very little use for things like stealth of pickpocketing. You can add some additional points to your attributes by attaching gems to your magical conductor, but you can add only two at any time, which does place some strict limits on how high the attributes go. Some of these gems add a direct bonus on an attribute some add percentual improvements on health and mana and some even give additional armour. Like in most, if not in all adventure/RPG hybrids, this again feels like a bare minimum system. As a side note, the gems you can equip do wear out, so if you get attached to some specific bonus item, you do have to bring the gems to a local blacksmith for a tune-up from time to time. The more worn they are, the more expensive it is to repair them and money doesn't hang from the trees in this game. The background art of Mage's Initiation is very good most of the time. On some scenes, there are some small bits which seem rushed or unfinished, but in general, the artwork is very pretty. A couple of cutscenes have been done in a bit uglier animation style which reminded me of those terrible looking CD-I Zelda games. The animation is decent as well and especially the lip-sync animations are very well done, albeit the portraits are otherwise static as far expressions go. As you might expect from a budget game like this, the voice acting is a hit an miss. While some of the voice work is very competent, I never did warm up to the voice of D'arc. While his voice is most of the time just there, some of the more dramatic scenes come out as unintentionally comedic. Like I said though, the voice work is a bit of hit and miss. D'arcs voice isn't the only with issues, but thankfully a good many of the actors fare much better. The weakest aspect of the game is, however, the combat system. The combat happens realtime, in the game environment, with an option to pause the game. You can target one enemy and maul it with spells until it dies. Some spells affect on a wider range, damaging more than one enemy. It is possible to move between screens and escape the battles as well. Depending on which you prefer, you can control the combat with either a mouse, keyboard or a combo of the two. Personally, I found the keyboard controls to be preferable. Sadly enough, the limits of the old Adventure Game Studio are quite clear with this combat system. The way the combat works is clumsy at best, even when compared to the combat systems of the other games in the genre, which all leave more than enough room for improvement. Quest for Glory-series tried several different combat methods, none of which managed to be more than serviceable. While the keyboard controls do work, the combat is never really challenging and if you die it feels you die because of how the controls work, not because you are facing some great challenge. 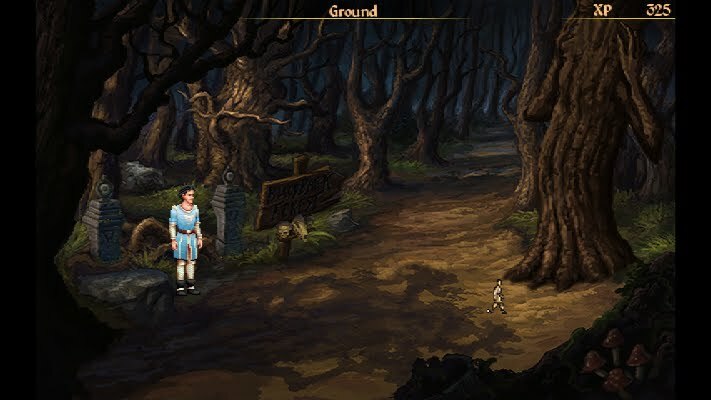 What the combats usually ends up as is you running in circles around the screen, throwing an attack spell on the enemy. At times you need to chuck a health potion, but other than that. The system is far from being either tactical or challenging. Even with multiple enemies on screen it is just about alternating between protective and assault spells. You can change the difficulty of the combat as well if you feel it is too hard. I kept it on the medium setting, as I was able to smash my way through the enemies or just escape them in a timely manner. And as you don't gain experience by killing stuff, the combat soon becomes a moot point anyway, if a couple of mandatory boss fights are not counted. The puzzles are mostly pretty simple. There are a couple, which do require a bit of thinking, but overall, the challenge should be on the easier side, especially if you pay attention to what people say and what kind of notes you find. But, as I stated earlier, you don't need to solve every puzzle you see. Interestingly enough, Mage's Initiation offers three different UI to use, so depending on what you prefer, you can play the game the way you want. If you feel nostalgic towards the old Sierra-style interface, you can use verb-icons that drop down from the upper part of the screen. The second option is a more Lucasfilm style verb-coin as they used in Full Throttle for an example. The third option is a compact, context-sensitive verb-icon menu. As Mage's Initiation does offer 4 different schools of magic and the school you choose does affect the game to a degree, it does offer at least some amount of replayability, if you are interested in seeing all the variations of the puzzles as well as the character specific content. It really is a shame, Himalaya didn't manage to make the combat work better, as that is a genuine scar on an otherwise rather competent game. I do hope it finds its audience, as I would love to see what Himalaya has planned for the future. 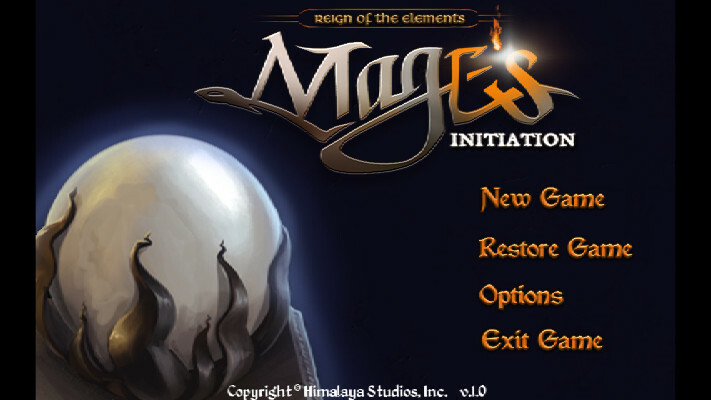 Mage's Initiation is available through GOG and Steam. If you are a fan of adventure/RPG hybrids, then it isn't a bad choice. It is far from perfect, but if you can overlook the clumsy combat, it is well worth checking out.